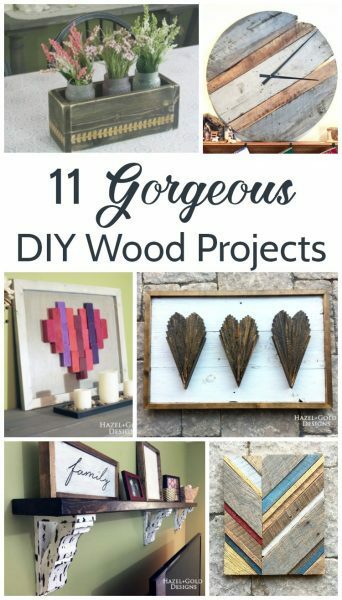 11 Gorgeous DIY Wood Projects - Lovely Etc. There is nothing like gorgeous wood to give any room warmth and texture. And I would even say every room needs a bit of wood somewhere – whether it is rustic reclaimed barn wood or polished mahogany. 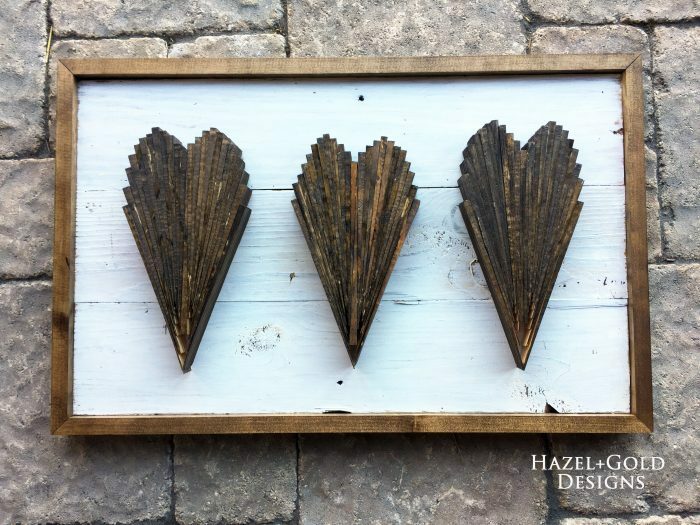 Today, I’m thrilled to have Sheri from Hazel + Gold Designs here sharing some beautiful DIY wood decor projects. I am so impressed with Sheri’s creativity and woodworking skills! And after seeing her ideas, my list of DIY projects to tackle just got a bit longer! Hello there! 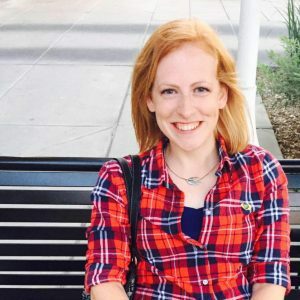 I’m honored to be a guest contributor here at Lovely Etc. Thanks for having me! I’m Sheri, and I’m the maker and DIY-er behind Hazel + Gold Designs. I love to create new things and to learn new skills that make my life a little more beautiful. I’ve been crafting since I was a little kid, learned to sew and crochet about 12 years ago, and just 3 years ago I took a try at building things and began my newest hobby of woodworking. I have so much to learn, but as I do I want to share those things with all of you! My blog is a combination of all sorts of crafts and I hope you’ll check it out! Today I want to share with you a collection of wooden home decor that I’ve created. I tried to throw in a nice range of projects; some are simple and some take a little more skill. That being said, trust me, if I can do it, you can do it! Just believe in yourself, use all safety precautions, and give it a go! You’ll just love being able to show this stuff off in your home! There’s something I really like about hearts. Maybe it’s that they remind me to be loving and kind. 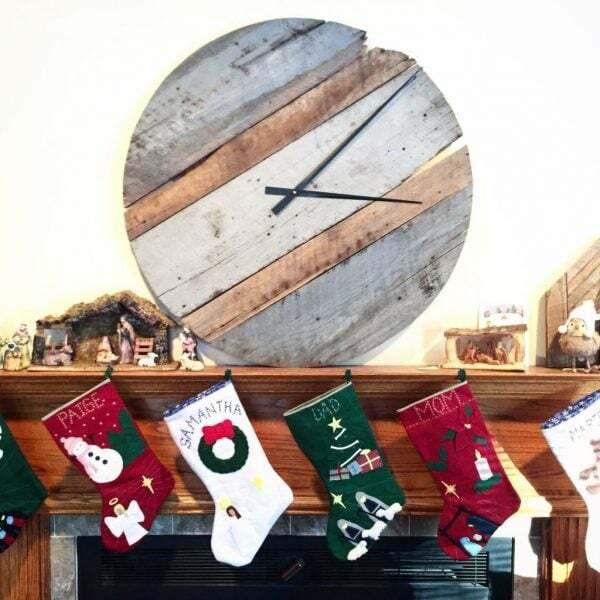 I created this DIY Wood Shim Hearts wall art using some extra packages of shims that I had laying around from my headboard project and a few pieces of shiplap from an old barn. It’s a perfect combination of farmhouse and wall art. Flowers also cheer me up for some reason. The represent beauty, growth and life. 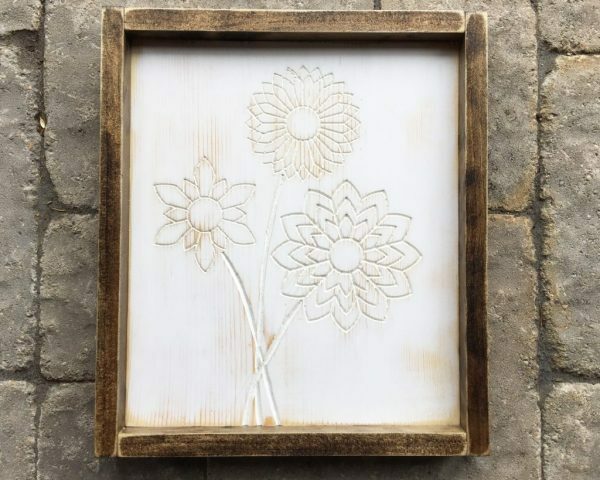 My DIY Wood Designs post is a bit different as it contains a couple of projects, but I wanted to be sure to share it so you could see this white floral engraved sign that I made using my router. This floral sign is one of my all-time favorites because it’s somehow simple and intricate all at the same time. You can often see it in the background of some of my other project photos. I have it on display in my living room. This is a project that takes some familiarity with a router, but any beginner could do it with the right tools. Do you have a Kindle collection like ours? Or maybe need something to hold up that recipe book while you are baking so it doesn’t get ingredients spilled all over it? Well, this DIY Wooden Book Holder was a project born of necessity. 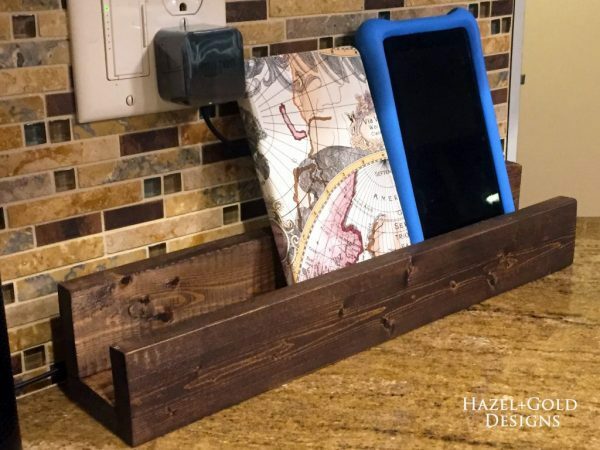 I literally just couldn’t take it one day because I spilled all over my recipe book AND we had kindles just stacked on the counters, so I had a couple spare hours and ran to the basement to make this holder. I have so many people comment on it because it’s not only functional, but it looks great sitting on my kitchen counter. Hearts, yet again. It’s all about LOVE. 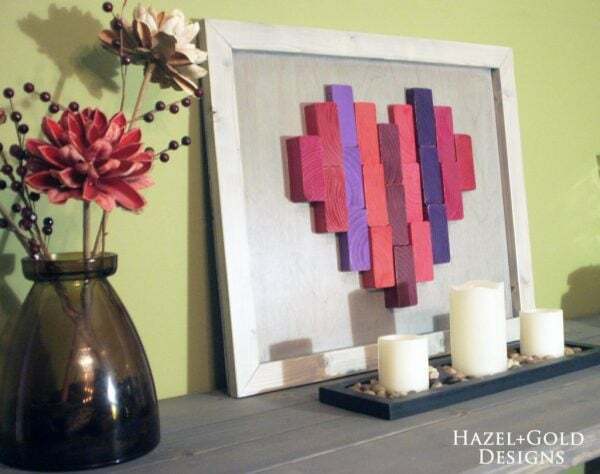 ;) I made this Wooden Heart Decor as part of a Valentine’s collaboration with a few other bloggers last February. If you love color, this project is for you! Even though it was made for the holiday, my daughter loves it so much that she has it hanging on the wall in her bedroom. It goes great with her room decor. 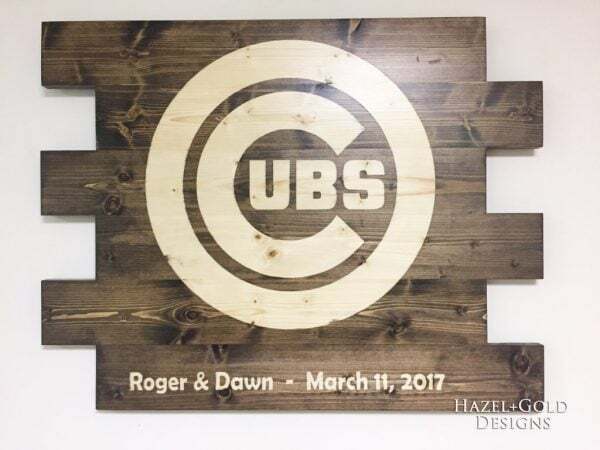 Sometimes you get the chance to make a really cool project for someone specific, and that’s exactly what this DIY Wooden Cubs Sign was for me. This couple had been engaged for a really long time and said they’d never marry unless the Cubs won the World Series. Well, as many of you know, that finally happened, and a friend of theirs ordered this custom-made sign from me for their wedding. I was honored to make it and just loved learning this new technique! A friend of mine here in Indiana tears down old barns and every once in awhile I’ll get a good supply of old barn wood from him for projects. That’s what led to me making this DIY Reclaimed Barn Wood Clock. I had some boards and a large clock mechanism, so it was a match made in heaven. This clock still sits in that very place, and I still love it, though I think from time to time about putting some numbers on it. Friends have given me mixed opinions on the matter, so it’ll remain un-numbered for now, probably until I finally do a fireplace makeover. When you’re a woodworker, no matter your skill level, you always have scraps laying around. This project was a way to use the 100-year old barn wood scraps that I had sitting in my shop. Because how do you throw out or burn barn wood that has lasted all that time? I don’t. I added some color this time too! Check it out. 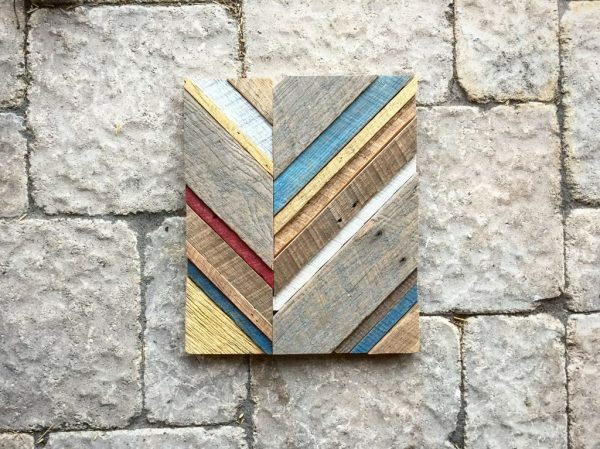 Reclaimed Barn Wood Art. So I have lived in my house for just one year, and my living room is in desperate need of a makeover. Unfortunately, time and money are not always easy to come by, especially when your project list is never-ending, and I don’t have enough of either to do the complete makeover. I had to do something though, so that’s why this project came to fruition. 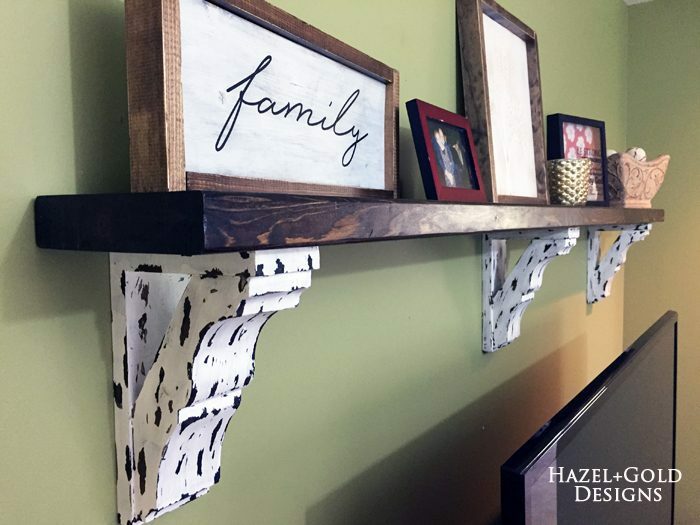 It’s one of my more recent projects, and most favorite – Farmhouse Style Corbel Shelf. It makes me just happy every time I see it. 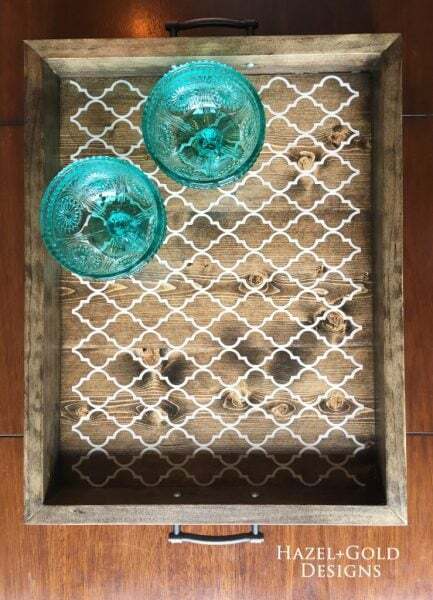 Now this Decorative Wood Serving Tray may not be home decor to some people, but I actually use it more as decor than an actual serving tray. It’s really pretty and adds a bit of pattern and texture to my dining room. I truly adore it. I completely adore all of the farmhouse centerpieces that I’ve seen all over the internet, and I really wanted to put my own spin on one. I threw this box together with a few scrap pieces of wood, some stain, gold paint, and a vinyl stencil. 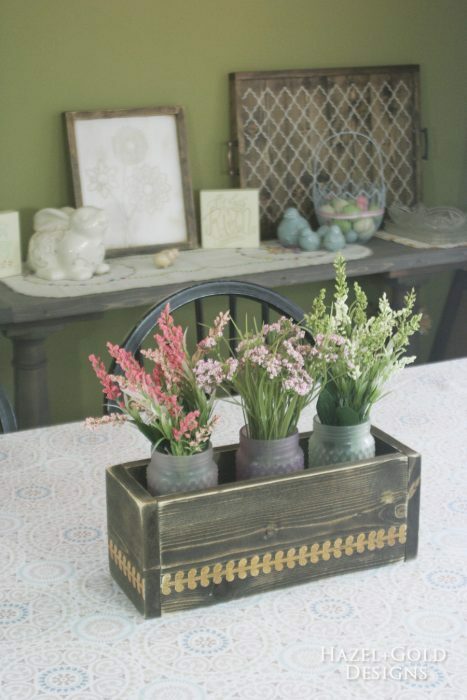 It’s so great in spring to have bright and happy home decor items to add to your rooms. This resides on our formal dining room table. 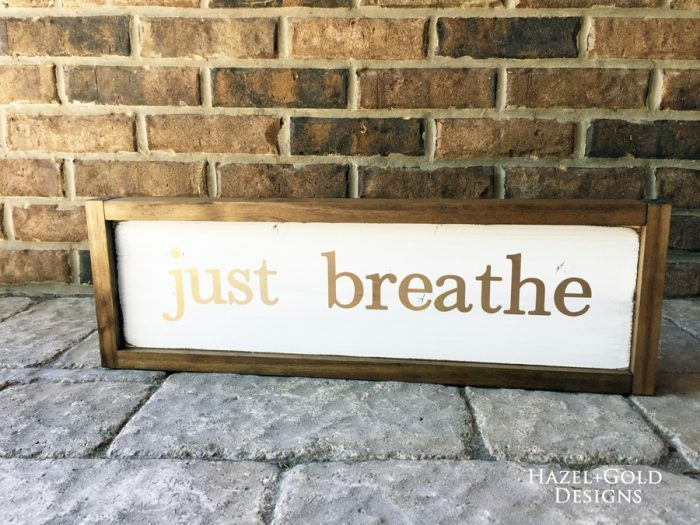 Alright, last but not least, my most recent project is this DIY Just Breathe wooden sign. It reminds me to stop stressing about the small things in life, keep a long term perspective, not get overwhelmed, and JUST BREATHE. I tend to stress a lot, and this sign is just what I needed. Well, I hope you enjoyed these projects! I certainly loved making them, and have them displayed all around my home. The greatest thing about these tutorials is that most of them are alterable and you can use the techniques to make custom decor for your own home. If you like any of these projects, be sure to head to Hazel + Gold Designs Blog and subscribe via email so you don’t miss a project! I’m also on Instagram, Facebook and Twitter, please follow! Thanks again for having me as a guest here at Lovely Etc. Love this! I will definitely try to make a few!